This Discussion Guide and accompanying DVD will help you and your group learn how to engage others in dialogue on six common objections to Christianity. 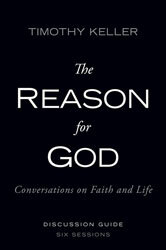 Whether in a group setting or individual conversation, The Reason for God is a resource for what to say in response to these objections, and a model for how to say it. Isn't the Bible a Myth? Hasn't Science Disproved Christianity? How Can You Say There Is Only One Way to God? What About Other Religions? What Gives You the Right to Tell Me How to Live My Life? Why Are There So Many Rules? Why Does God Allow Suffering? Why Is There So Much Evil in the World? Why Is the Church Responsible for So Much Injustice? Why Are Christians Such Hypocrites? How Can God Be Full of Love and Wrath at the Same Time? How Can God Send Good People to Hell?